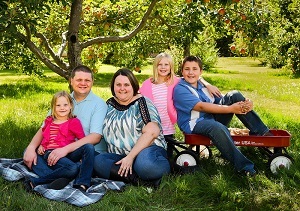 New NAB Missionaries to Brazil – North American Baptists, Inc.
We are pleased to announce that Brandon and Marci Jones are planning to join our missionary team in Brazil. Both Brandon and Marci have had a passion for missions since a young age, Marci having been raised on the mission field of Kenya and Brandon in a church passionate about missions. After getting married, receiving biblical education, having three children, and pastoring a church the past few years in South Dakota, they are confident in this calling that God has been stirring in them for many years! In the summer of 2016, Brandon and Marci spent two weeks in Brazil. Brandon taught a seminary class at night and both of them had the privilege of visiting churches and church plants in the region, meeting their leaders. Upon returning home, they discerned God’s call to the field and how He has equipped them both to serve as missionaries in Brazil, where they get to be a part of God’s work raising up the next generation of church leaders there. To support the Joneses, or simply to get to know them, click below. Get to know the Jones Family.